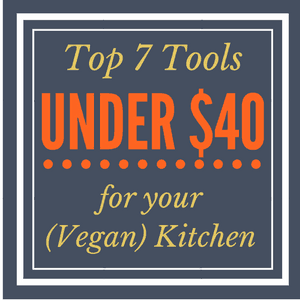 A detailed list of the top 10 pantry staples for a vegan and gluten free diet, breaking down items with protein makeup and recipe examples! 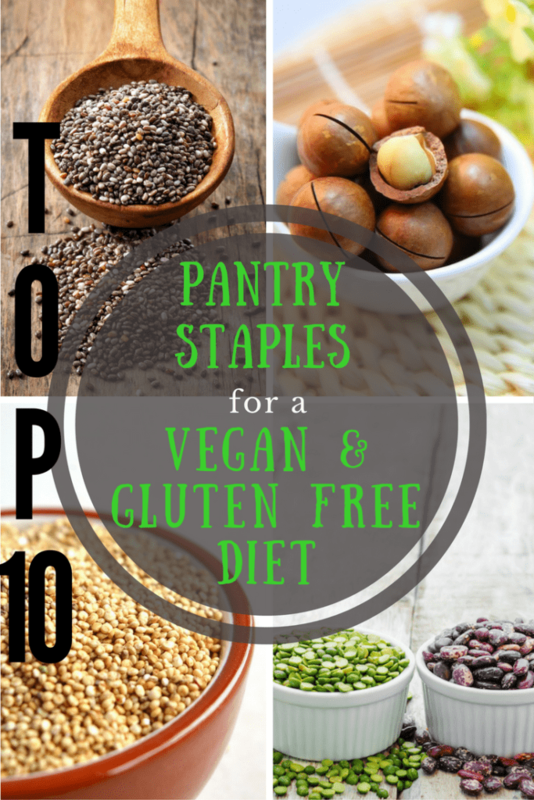 I’m really excited to share this post with you today listing the top 10 pantry staples for a vegan and gluten free diet! When people start to adopt a vegan or gluten free lifestyle (or especially a combination of the two! ), it can feel intimidating and like you have no idea where to start. When something is new it’s unfamiliar and many of your usual habits, conveniences and fall backs can seem to disappear… leaving you feeling like you don’t know what to eat or cook. Often you’ll just go back to eating fill-in-the-blank (eggs, cheese, fish, regular bread) because you just don’t know what to do. After a couple years of eating vegan, and 7 years of eating gluten free, I can tell you – it’s really not that hard. I promise. Once you get familiar with what you CAN eat, versus what you CAN’T, your entire world will open up and you’ll see that there are plenty of delicious, satisfying and easy options in this lifestyle too. The key, just like with any diet or lifestyle, is being prepared and having what you need on hand. That’s why I’ve put together this list of my Top 10 Pantry Staples, in hopes that it will support you in knowing what to grab the next time you’re at the grocery store. Instead of the can of tuna, buy a can of chickpeas. Instead of cheese, buy nutritional yeast. You’ll get the hang of it and soon you’ll be so used to not even needing to go down certain aisles of your grocery store that your shopping will be a breeze! So here it is ladies and gents – your top 10 plant-based pantry staples for a vegan and gluten free diet. OK – I’m totally cheating here and listing many things under one number, so this is more of an overall category than one specific item – but I want you to see how JUST this one category ALONE has so many options and is GREAT for meeting your protein needs! 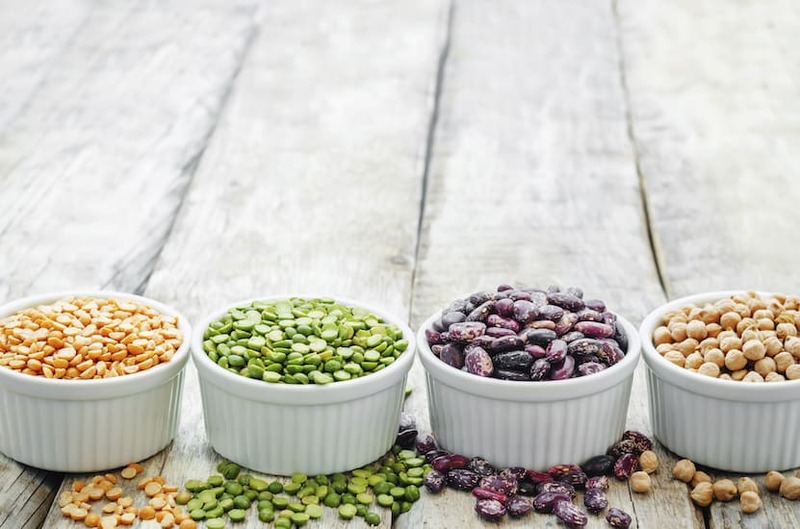 Beans and legumes are versatile and affordable. They’re also high in antioxidants, fiber, B vitamins, iron, magnesium, potassium, copper and zinc. Those of you who follow my blog know that I’m kind of obsessed with this stuff. With its winning combination of cheesy flavor + B-12 and protein, I can’t find a flaw. I sprinkle it on pasta, in sauces, on soups, on veggies… doesn’t really matter what it is, my hand is often reaching for a container of nutritional yeast! If you’ve never heard of or tried nutritional yeast, don’t be turned off by it’s funky name. It’s simply an inactive yeast that adds flavor to any dish, and is a great source of B-vitamins (particularly B-12 which vegans need), folic acid, selenium, zinc and protein. Not all brands all fortified with B-12 but most are, such as Now Foods . Seeds are not only a great source of protein, fiber and Vitamin E, but also add yummy flavors and crunch to whatever you’re eating. Perfect on top of salads, pasta, veggies, yogurt, oatmeal – you name it! Seed butters like sunflower seed butter and tahini are also super tasty and versatile to make dressings, sauces, desserts, or spread on toast or rice cakes. I recommend raw seeds and ideally organic. 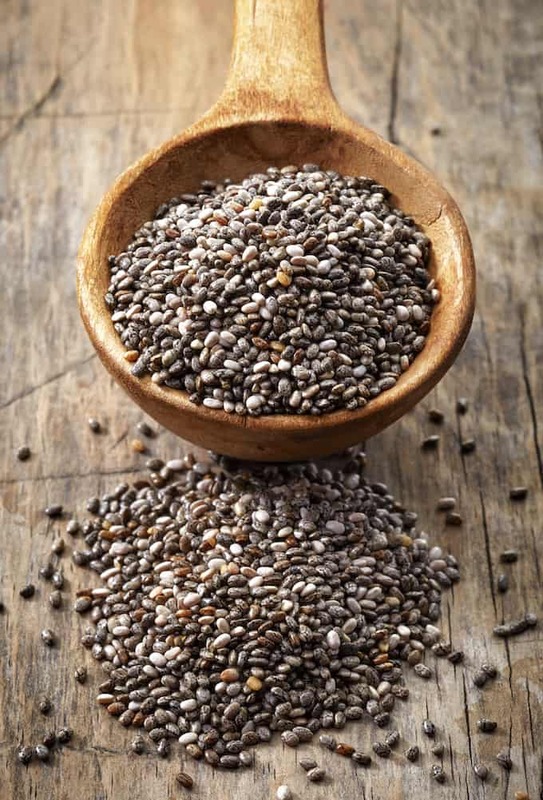 You can see how incorporating seeds into your daily meals can really add up to support your protein needs! Tamari is a gluten free soy sauce, and is one of my favorite flavors that I use regularly. To me it’s richer, thicker, less salty and more balanced than regular soy sauce (though still pretty high in sodium so I usually buy a low sodium brand). Tamari is fermented and contributes a savory, umami flavor to any dish! I always buy organic since soy is a highly GMO crop. If you can’t eat soy, coconut aminos is a great option. It’s made from raw, coconut tree sap and sun-dried sea salt, then naturally aged. It has a dark, rich flavor with a faint sweet aftertaste, and is usually lower in sodium (so you may need to add a pinch of salt to any recipe calling for Tamari if you’re subbing Coonut Aminos). Coconut Aminos also contain a higher level of 17 amino acids, which may contribute to heart health, digestive health, and mood stabilization. Nut butters – peanut butter, almond butter, cashew butter, hazelnut butter, etc. – are, to me, one the most delicious things in my pantry. While perfect as a spread with breakfast, lunch or a snack, I also use them frequently in sauces, baking and other recipes. Canned coconut milk is a more versatile ingredient than meets the eye. It’s rich, thick and creamy consistency lends itself perfectly to curries, stews, baked goods, puddings, savory side dishes and even homemade coconut whipped cream! Boxed coconut milk is usually not as thick and almost always has preservatives/additives. Make sure you check the label for 1) a BPA free can and 2) additive free – just water and coconut as the ingredients if possible. I prefer using the regular, whole coconut milk vs. the light for it’s richness. I’m cheating again and listing a huge variety under this one big category of whole grains. While each grain is different, overall whole grains are full of nutrients, including fiber, protein, B vitamins and antioxidants. 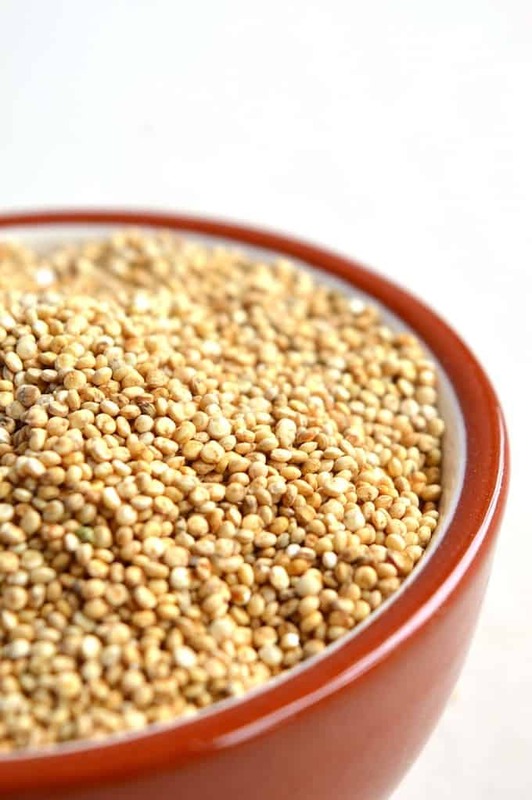 All of these grains can be cooked plain with water or vegetable broth and then seasoned, or used more creatively in casseroles, porridge, pancakes and other sweet dishes. *Oats are inherently gluten-free, but are frequently contaminated with wheat during growing or processing – so be sure to check the label to verify gluten free. Protein powder is a perfect pantry staple because it’s an easy way to supplement our protein needs, especially if you’re exercising and living an active life and need additional protein to meet your daily needs. Throw it in a smoothie, mix into yogurt, experiment with adding it to homemade breads or baked goods, or simply shake it with some plant-based milk. There are a variety of flavors too from plain to chocolate to chai to vanilla, so you’ll never get bored! Vegetable broth is a key ingredient in making soups, stews and other savory dishes. It can also be used instead of water to steam or lightly saute vegetables, to infuse extra flavor. Same goes for using it to cook whole grains like rice, quinoa and buckwheat – simply replace it for water in the cooking process and even add a squeeze of lemon or lime to the broth, depending what flavor you’re going for. While some brands needs to stay refrigerated, other brands of nondairy milk have a pantry shelf life (prior to opening of course, once opened you need to refrigerate), which is super convenient so that you can always have a backup on hand and never run out of milk! 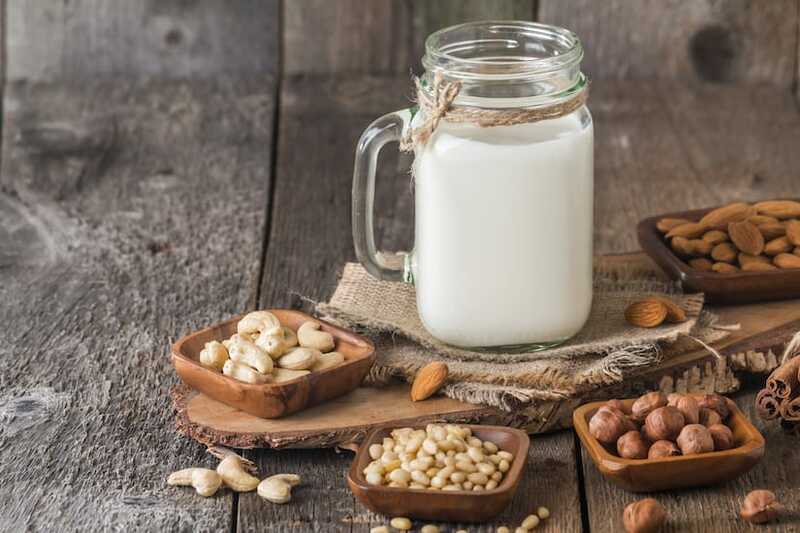 Plant-based milks can be used for so many things, from pouring over cereal or granola, using as coffee creamer, in smoothies, sauces, cheeses, desserts or simply enjoying a glass (maybe with a cookie..?!). 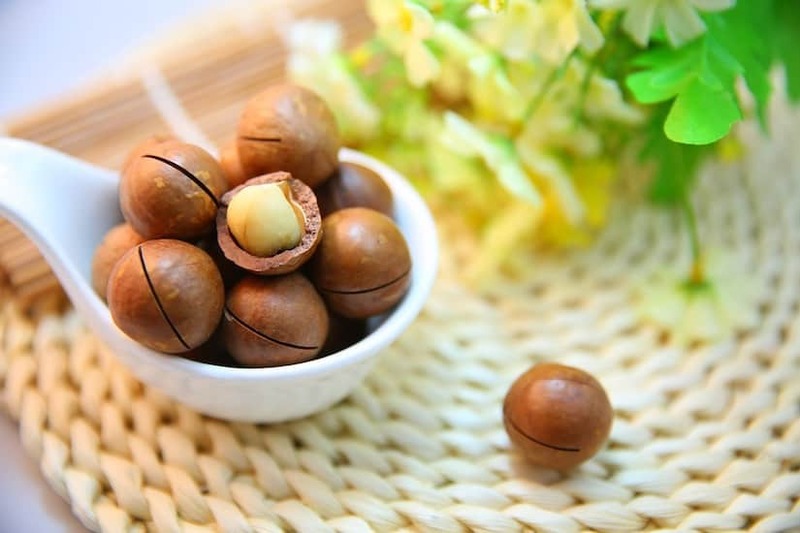 Each type (almond, hemp, flax, hazelnut, rice, soy, oat) tastes different and there are a variety of flavors on top of that, from completely plain and unsweetened to chocolate and vanilla – so experiment and see what you like! I almost always go for a completely plain and unsweetened flavor (I know, boring!) and like mixing up which base I buy (almond, hemp, flax). Sometimes I even make my own! Did you enjoy this post? I’d love to know if you found this helpful or have any questions in the comments below! This is an excellent list! Appreciated.